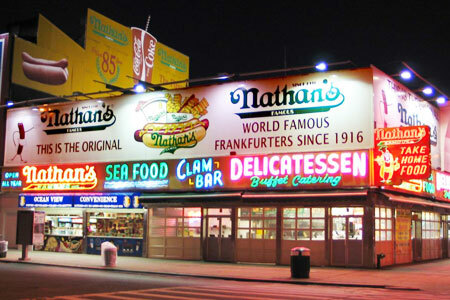 : Although there are lots of franchises, you've got to travel to Coney Island to sample New York's most famous hot dog in its original freestanding building that's been around since 1916. It's now worn enough to fit right in with its seedy surroundings. But this is an institution. No hard decisions here: a hot dog (or two), mustard, maybe some relish if you’re so inclined, an order of fat waffle fries and crisp lemonade to wash it all down. If you happen upon Nathan's on July 4th weekend, you may just witness the annual hot dog eating contest, which is loads of fun. Other locations.